Out of fresh, fun party ideas for the holidays? Stuck in a rut of same, same holiday appetizers, main dishes and desserts. Ugh. It’s a chore to figure out new ways to WOW your guests. But, Yay, Good news! We’ve got some great ideas to kick your parties up a notch! Cheese and crackers – one of the most popular appetizers of all time. This idea is epic – and put’s old school appetizers to shame. Now, everyone is familiar with chocolate fondue – and frankly everyone loves it. But you may be surprised to learn that cheese fondue comes in a close 2nd. There are so many good options for cheese fondue that are creamy, delish and go with a large assortment of dippers. Our Secret Weapon will really put the FUN in FONDUE – the Sephra Home Fondue Fountain – flows Cheese Fondue. Sephra offers the ONLY chocolate / fondue fountain on the market today which successfully flows cheese fondue. Other, lesser quality fountains, can’t keep up with the heat demands, and soon, you need a knife to spread your fondue. Not so with Sephra Fondue Fountains – home fountains as well as commercial. Your cheese fondue flows warm and cheesy to the last dip! So get a Sephra Home Fondue Fountain – they are totally the best you can buy and so versatile – you can flow lots of fondue recipes! Check out the Fondue Fountain Challenge, using the Sephra Select! As the holiday season approaches, we’ve got lots on our “to do” list. Probably one of those tasks includes holding a gathering for friends, family or co-workers… which may be the most dreaded task of all. Something that isn’t store bought and off the shelf, but also something that isn’t going to take 3 days to prepare. All of our cheese fondue suggestions are easy. We don’t like to be stuck in the kitchen any more than you do, so we look for short-cuts and recipes to give you the biggest bang for your buck! Don’t save this just for Cinco de Mayo. The easiest cheese fondue is simply going to Costco and buying a big can of Queso Nacho Cheese; adding chicken broth to the desired consistency, grabbing a bag of tortilla chips and calling it a Nachos Cheese Fountain! Yum! Now, turn your nacho cheese fountain into a main dish and the center of your Christmas party food by surrounding it with taco fixin’s, like taco meat, chopped tomatoes, sour cream, chopped olives, refried beans, chopped green onions, salsa and lots of chips! This is a self-serve main dish – MAJOR Nachos – or great for Christmas party appetizers. It all depends on what you serve to go with your cheese fondue. That’s just the beginning. We’ve got a couple of other cheese fondue recipes which are almost as easy and give you more variety for easy appetizers. Image from BuzzFeed. Fountain from Sephra. Grab chicken wings from your local market, a big bottle of Kraft Bleu cheese dressing, a bottle of Frank’s Hot sauce and two 8-oz. packages of cream cheese. 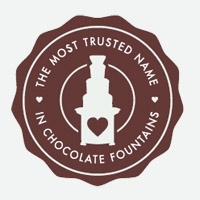 (Your Sephra Select chocolate fountain holds 5 cups of melted liquid). Place all three ingredients in a crockpot for 2 hours on low heat to melt, or melt very slowly over low heat on top of the stove. Use the hot sauce to taste. See complete recipe below. When melted, transfer the cheese mixture to the fondue fountain, but don’t switch on the heat button; you want this at room temperature. 2 cups Bleu Cheese Dressing (Hidden Valley Ranch Dressing for variety) 5-10 ounces Franks hot sauce: to taste 3- 8 ounce packages cream cheese Melt all ingredients to a smooth consistency. Use your viscosity cup – if the dressing mixture runs through the cup in 8 – 10 seconds, it’s ready to put in the fountain. If it’s too thick, add chicken broth to obtain the perfect flowing consistency. Now, grab those wings and some celery sticks and you’ll swear you’re in Buffalo where this whole thing is supposed to have started (yeah, I’ve heard it started in Boston, too, but who cares?) What fun for you and your buddies / gal pals! The above recipe can be used, substituting Ranch Dressing for the Bleu Cheese and you’ve got a totally different flavor. Perhaps some of your crew doesn’t ‘do’ bleu cheese, so this is perfect switch-out, and again, just don’t turn the heat switch on the fountain, as you’ll want to serve this dressing at room temperature. I’d suggest you run the tomatoes through your blender to form a smooth texture so the little chunks don’t “break” the cheese fountain curtain. Melt all ingredients in a saucepan over very low heat until melted; using chicken broth, water or milk to thin to the proper consistency. Add to preheated fountain and turn on and go! These recipes are so easy and look so elegant when flowing over the fountain tiers; makes you look like the perfect host and like you’ve worked for hours, yet it’s just a matter of combining a few ingredients and assembling dipping items. Add a side bar of drink choices… and a buffet of cookies or sweets and you’re done! One last suggestion for you… could go on and on, there are so many options available for your Sephra Home Fountain. This cheese fondue runs along the lines of the original fondue made with Swiss cheese. It will take a little longer to make, but it’s well worth it. Melt butter over low heat and then add the cornstarch, stirring until combined. Mix in salt and slowly add milk. Stir continually over low heat until boiling. Continue to stir and boil one minute. Turn the heat down and add the cheese. Mix just until the cheese is melted and transfer to fountain. If you have extra, just add it when your basin starts getting low. Again, adding additional milk to reach desired flowing consistency, as needed. Serve with your favorite dippers. We’ll suggest the following dippers; you pick and choose your favorites. Chicken wings, Cubed Ham, Little Smokies, Broccoli, Cauliflower, Carrots, Celery, Salted fingerling potatoes, French Bread Cubes, Slices Apples and Tortilla chips. Serve whatever you like and enjoy! The Sephra Cheese Fondue Fountain is a smash hit! People just love it and you’ve got another reason to use that Fountain; in fact, in the next 3 months, (including Super Bowl snacks) I can think of at least 8 times when stoking up the fountain is the easiest, most fun and stress-free way to entertain. So, have at it, friends. Sweet or Savory, your Sephra Chocolate Fountain will serve you well as we begin a new winter season, and soon a New Year.